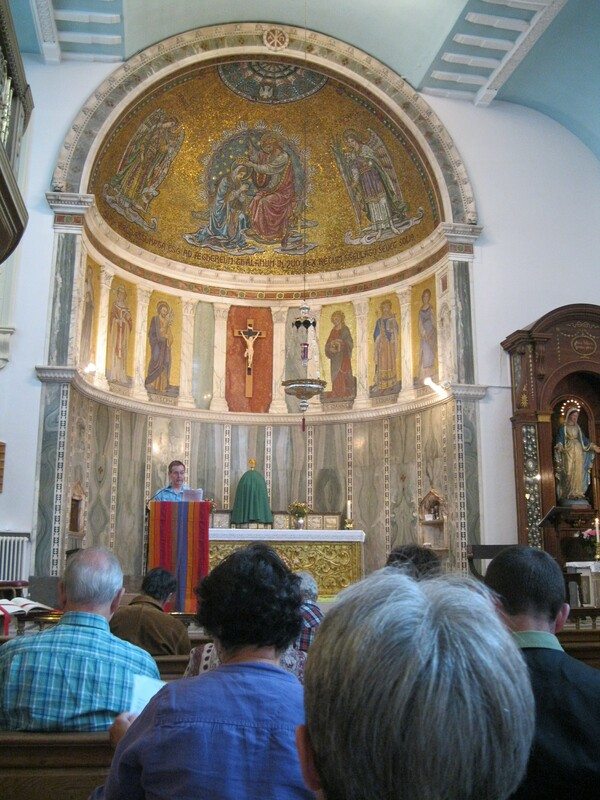 While in London, England, for World Pride, I was blessed to be able to attend one of the Soho Masses, sponsored here by the Archdiocese of Westminster (London) for the LGBT community. It was a beautiful service filled with a great spirit of hospitality and solidarity. The Masses are held on the first and third Sundays of the month, 5:00 pm, at the Church of Our Lady of the Assumption & St. Gregory, Warwick Street, in the Soho neighborhood of London, which is the center of the LGBT community. When I attended yesterday, the church was packed, with what I estimated to be about 125 people. “Masses in Westminster Diocese, welcoming LGBT Catholics, parents, families and friends, began in April 1999 on the Sunday following the bombing of the Admiral Duncan public-house in Old Compton Street. These liturgies were first held in the Convent of the Helpers of the Holy Souls in Camden Town, London. “When the Convent property was sold in 2001, the LGBT worshiping community relocated temporarily to St. Anne’s Anglican Church, Dean Street, Soho. As the congregation enlarged in its Soho location, it eventually outgrew the space available. “In March 2007, following a period of consultation with Diocesan representatives, lesbian, gay, bisexual, transgendered Catholics, parents and friends were invited to transfer 1st & 3rd Sunday 5.00 pm Masses from St. Anne’s Anglican Church, Soho to the Church of Our Lady of the Assumption & St. Gregory, Warwick Street, Soho. A statement encouraging “full and active participation” by LGBT Catholics in the life of the Church was issued by the Diocese of Westminster on 2 February 2007. The Soho Masses Pastoral Council was invited to make its own statement regarding the initiative. A further statement from Westminster Diocese confirming this pastoral provision was released on 17 December 2007.
we, too, have our place at the Lord’s table. The community gathered for liturgy was amazingly diverse in terms of age, gender, race and ethnicity. At the social hour afterward, even I, as a newcomer, was made to feel very welcome by people I had never met, and who did not know that I was a foreign visitor. The Soho Masses are clearly doing the work of God here in London, not only providing a welcome to the ostracized, but providing an opportunity for people to be of service to one another and to the church and the world. If you visit London, you should be sure to schedule a visit for one of these wonderful liturgies. For more information, click here. Thanks for the commendation, Frank. The British Orthotoxic Catholics often depict our Masses as a den of depravity, but first time visitors are often surprised to find that it’s “just a Mass” – but what a Mass, particularly well done. Your observation on the warm welcome is also a common response – I’m pleased that you were able to experience it too, as many other visitors have done.